So far, much of the lettering I’ve done so far has needed to emulate a previous Letterer’s work. 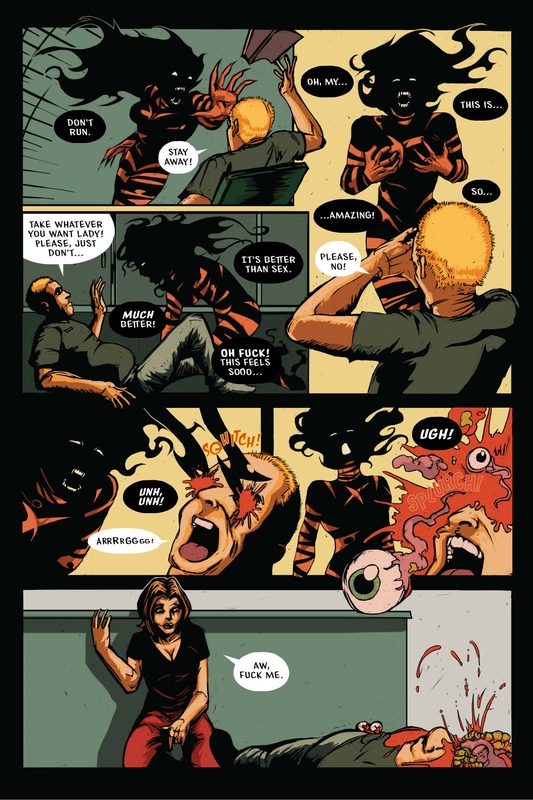 In these cases, the balloons, font choices, and text styling are based on the work of the previous Letterer –to keep the feel and tone of the book’s styling consistent and intact. The Infernal Pact is a perfect example of this. The original Letterer (Rachele Deering) started the project with a very strong and original aesthetic (strokeless, uneven balloons, with a stark, clean and simple look). So, when I took over lettering duties in issue #2, I did my best to keep with that general styling but found small ways to add a bit of my own personal style into the final product. All the while keeping in mind the book is a Grindhouse style book, so I had to ensure just a touch of campy could be felt in the end product. 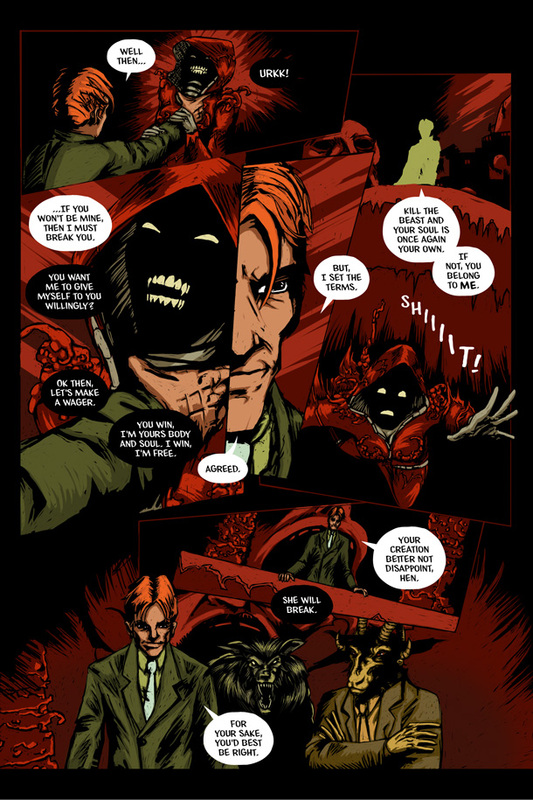 By the series finale (issue #3), the books art, story, and layout had developed and grown quite a bit (a credit to Joe’s never-ending desire to push himself and grow), so I allowed the lettering style to follow suit –still careful to keep the books original styling as the basis for any new effects or options. The results, I think, speak for themselves. Issue #3 was a crazy ride into Hell, so we tried to evoke that feeling with the lettering and specifically the SFX (which had evolved quite a bit by then). We pushed the SFX to the edge of campy, almost too much on purpose, without allowing them to take over the pages. It was a really fun project. I can’t wait to begin work on The Infernal Pact, Part 2: The Whore of Babylon! Anway, without any further ado, here are a few of my favorite Finished pages with a brief description/explanation of the pages lettering goals. Below are a few highlighted pages, you’ll find a link to my full gallery of lettering samples. Or, you can just click HERE to go directly to the gallery. The Infernal Pact #2, Page 24. This first sample comes from The Infernal Pact #2. This is my favorite page from the book. The lettering was used to enhance the frantic nature of the scene. Though the dialog balloons are scattered about the page almost willy-nilly, they have been carefully placed to reinforce the cramped space and hectic nature of Burt’s struggle, and the uncontrollable urges which drive Witch Bea in the scene. The Infernal Pact #3, Page 13. This page comes from The Infernal Pact #3. Making the conversation flow well in such a non-traditional panel/page layout took some work. But the end results flow rather well. The letter placement reinforces the eye-pathing of the panel layout, moving the eyes from one balloon to the next even though the compositional flow of the page goes against our brains normal reading patterns. Or continue on to Page 2 of Lettering Samples.